Get your water coolers tomorrow: Order before 5pm if you’re in London or the M25 area (terms and conditions apply). Call us on 020 8752 0110 now to open your account and place your first order. READ ABOUT OUR FREE LOAN BOTTLED WATER COOLERS. Keep your staff hydrated and focused by installing several bottled, or plumbed, water coolers throughout your business premises. We offer a variety of coolers (including floor-standing and desktop models), and our bottled variants can be loaned for free. We offer a variety of still and carbonated bottles of water for coolers, from great brands like BELU: an ethical brand partnered with Zepbrook and donating all profits to the WaterAid charity. We can also deliver water cooler bottle storage racks, including mini versions. 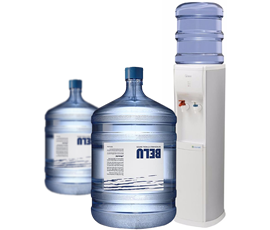 Need a water cooler not currently listed on our website? Contact us – we can source and deliver many coolers for a budget-busting price.